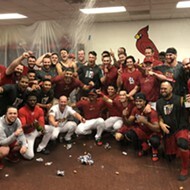 After a pair of heart-stopping comeback wins last weekend, the Memphis Redbirds advanced to the Pacific Coast League (PCL) championship series for a second straight season where they'll defend their title against the Triple-A affiliate of the world champion Houston Astros, the Fresno Grizzlies. Battling Mother Nature in both Oklahoma City (where they split the first two games of the best-of-five semifinal series) and Memphis, the Redbirds beat a hot Dodger team in four games, the last two in walk-off fashion. In Game 3 Friday night, Alex Mejia, Lane Thomas, and Max Schrock delivered consecutive RBI singles in the bottom of the ninth inning to erase a 4-2 Oklahoma City lead and give Memphis a 2-1 series advantage. 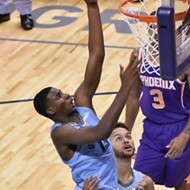 But that comeback served merely as prelude to Sunday's epic Game 4. 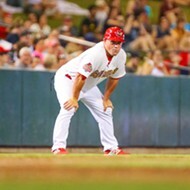 The Redbirds tied Sunday's game at a run apiece in the bottom of the seventh inning on a sacrifice fly by Tommy Edman. 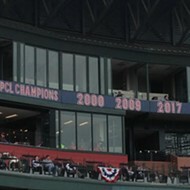 (The game had been scheduled for seven innings, as Game 5 would have followed had the Dodgers won.) Oklahoma City took a two-run lead in the top of the 10th inning on a home run by Henry Ramos. But the Redbirds rallied again, this time tying the score at 3 on a two-out, two-strike single by Alex Mejia. Then, things got a little weird. 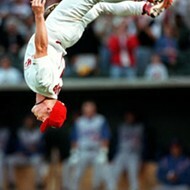 Edman reached second after drilling the ball off the Dodgers' first baseman, putting Redbirds at second and third. Oklahoma City manager Bill Haselman then seemed to corner Redbirds manager Stubby Clapp by walking Schrock. Out of position players on his bench, Clapp was forced to let relief pitcher Giovanny Gallegos bat with the winning run 90 feet away. Gallegos had exactly one at-bat in his seven-year professional career. Gallegos clubbed the baseball over the leftfielder's head for a series-clinching walkoff victory. Such is Redbirds baseball in what can now be called the Stubby Clapp era. Pieces of a good team are removed. Others arrive, suit up, and impact victories. 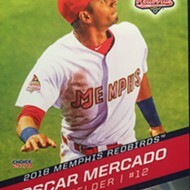 The 2018 Redbirds, for a time, had the finest outfield in the minor leagues: Tyler O'Neill, Oscar Mercado, and Adolis García. 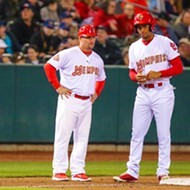 Mercado was traded in late July and O'Neill and García are now helping the St. Louis Cardinals fight for a big-league playoff spot. In April, Memphis had what appeared to be an electric rotation of starting pitchers: Jack Flaherty, Austin Gomber, John Gant, Daniel Poncedeleon, and Dakota Hudson. 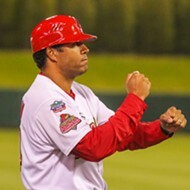 Hudson won 13 games for the Redbirds and earned PCL Pitcher of the Year honors. But all five men are now pitching for the Cardinals, leaving the likes of Jake Woodford, former Cardinal Tyler Lyons, and Kevin Herget to take turns in the PCL playoffs. And take their turns they will, now three games from back-to-back championships for a man — already a back-to-back PCL Manager of the Year — who may be on to new ventures next spring. When the Toronto Blue Jays announced last week that manager John Gibbons will not return in 2019, Clapp's name instantly became an offseason talking point. (Clapp is a native of Windsor, Ontario.) Would a major-league team hire a manager with no experience in such a role at the game's highest level? Check out the managers' offices at Yankee Stadium and Fenway Park as the Yankees and Red Sox prepare for this year's postseason. 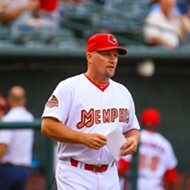 For at least three more games, though, Stubby Clapp will command the Memphis Redbirds. (The championship series opens Tuesday night in Fresno, with Games 3 through 5 scheduled for AutoZone Park, starting Friday night.) You can bet against the Redbirds at your wallet's peril. Clapp has emphasized "never say die" for two seasons now as a Triple-A manager. When relief pitchers are drilling series-winning hits to the wall, perhaps it's time we all believe in the mantra. Can Redbirds Weather Cardinals' Transition Storm? 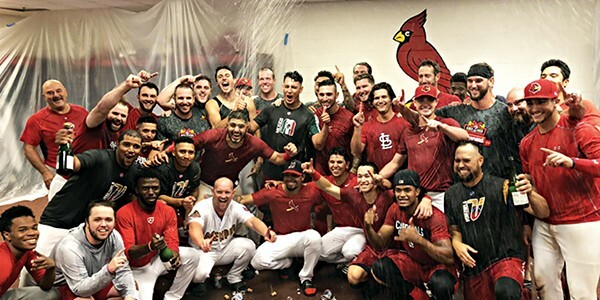 2018 Redbirds Preview: Encore Season?